It's easy! My teacher showed me how. 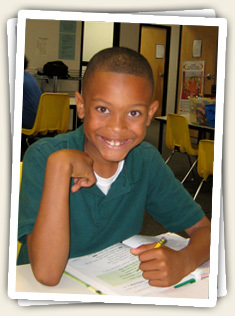 From 3rd grade on, students are given the Standford Achievement Test-9 (SAT-9) each year. Our finding is that nearly 70 percent of Mt. Helix Academy student score in the top quartile on one or more subtests. Students who started at Mt. Helix Academy as Kindergartners enter first grade with unusually strong reading skills. Without exception, every child can read and many begin first grade reading third grade level texts. We administer the Wechsler Individualized Achievement Test (WIAT) to 1st and 2nd graders in spring and, of the 55 students in 1st and 2nd grade (93%), 51 scored in the top quartile on the reading component. When these students enter third grade, they are reading at a beginning 5th grade level, with a high rate of fluency and excellent comprehension. Their strategic reading skills permit our 3rd – 5th graders to comprehend a broad array of classic and contemporary reading genres, including factual articles, novels, short stories, biographies, myths, folktales, and poetry. The result is that they acquire a vast amount of knowledge that prepares them for successful academic experiences and it shows in their Stanford Achievement Test scores on which 45 percent of our Elementary Module students score in the top quartile. Students in the Primary Module demonstrate excellent understanding of important mathematical concepts including fractions, place value, measurement, time, money, and obtaining solutions to increasingly complex word problems. They also exhibit mastery of computation skills that are usually taught in the third grade, including multiplication of 3 digit numbers and division. At the end of second grade, most Mt. Helix Academy students are studying mid-third to end of third grade math. Because students do daily fluency drills on math facts in addition, subtraction and multiplication, students display a high level of automaticity in their recall of facts. This greatly facilitates their acquisition of higher-level mathematical skills. On graduating from the Elementary Module, students demonstrate a strong foundation in whole number operations, fractions, decimals, percentage, ratios, probability, geometry, and solving multi-step word problems. They demonstrate a high level of fluency in all math facts. Forty-four percent of Mt. Helix Academy’s 1st – 5th graders score in the top quartile in math on standardized tests. Beginning in the Primary Module and continuing in the Elementary Module, students are carefully taught many critical study and organizational skills. Students in the Primary Module organize their desks and materials, complete a homework log, and bring materials to and from home in their Homework Folder. In the Elementary Module, students are taught to maintain organized binders, take responsibility for having the necessary materials for class each day, write down assignments on their assignment calendars, answer questions in complete sentences, take notes from oral and written presentations, and actively read their textbooks for specific information. These skills are vitally important in allowing students to maximize their potential in their academic classes. The strong social skills that Primary and Elementary Module students demonstrate are equal in importance to their academic accomplishments. Beginning in Kindergarten and continuing through the Elementary Module, students are directly taught and given many opportunities to practice effective, positive conflict resolution skills. On the playground, our students are frequently observed using “Rock, Paper, Scissors” and other strategies to solve problems with fellow students. Our students are often heard making positive comments about their peers and celebrating each other’s accomplishments. They take great pride in receiving a “blue ticket” and signing the “Principal’s Caught Doing the Right Thing” book for their acts of kindness, responsible citizenship, voluntarily helping to maintain our campus, and other desirable behaviors. When our students are off-campus on field trips, adults from the community regularly comment on how well behaved and respectful Mt. Helix Academy students are.